Toad (aka Toady-toady, Toadaroni, The Toadster) passed away yesterday morning. She was a sweet, gentle, skittish, obese critter- really fast and strong, but easily frightened. Her and her roommate Link (aka Sinky) were our first pair of mice, and were the best of buds. Over the last week Toad just lost steam; no real symptoms, she just wasn't her usual active self, and didn't seem to have much appetite for anything but treats. The last couple of nights she slept away from the nest, but Stinky migrated with her and snuggled her. Anyway, here's to Toad! 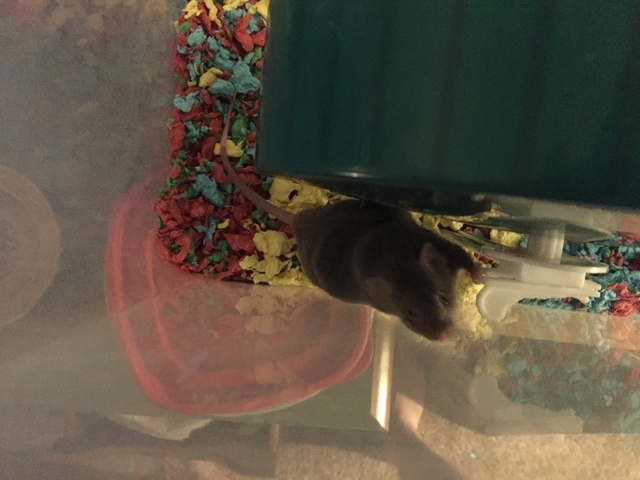 One of our first mice, who stayed strong (and fat) to the very end, somehow living to about two despite us knowing almost nothing about mousies when we got her. On a positive note, we integrated Stinky with our other colony last night once they all woke up. A thouroughly cleaned tank, a watchful night, and a bunch of mealworms and cheerios later they're all snoozing together in the nest. She sounds like she was a fine mouse and a faithful friend. I'm glad to hear link had a family to move in with. Rest in peace, sweet little Toad. I hope Link continues to loves her new mouse family, and I hope you're doing well too. Toad is now buried on a sunny hiltop by a tree; her roomie Link is not far behind, she has a tumor and is losing steam fast. The new colony is taking care of her for now though. I'm so sorry to hear about the loss of Toady. I'm glad to hear Link has new friends to help he with her loss. I hope you are ok. God bless Toady.